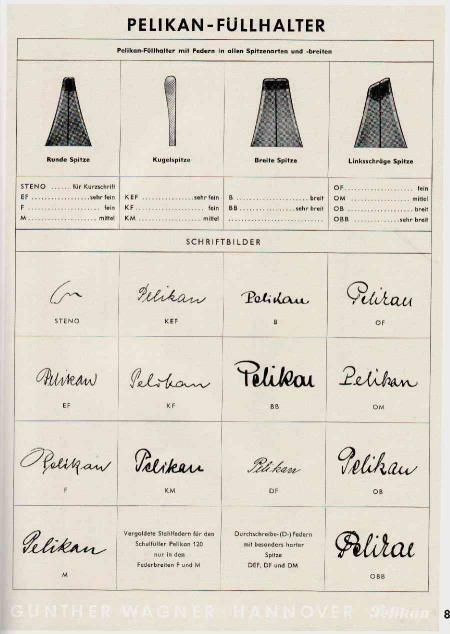 A lot of nibs in different kinds and widths were always offered from the manufactory Günter Wagner for the Pelikan fountain pen. In the 1950's the following nibs, shown in the picture below, were available in the models 400, 400N and 400NN. Nibs from model 140 are smaller than nibs from model 400, also nibs from model 120. But a 100N nib fit into a nib unit 140 pen does not create a problem. Nibs of the model 100N are same size as the Pelikan model 400 nibs of the era 1950/1956 until model 400NN of 1956/1965. Nib units but are different. They could not screw into other Pelikan. But you might disassemble the nib and use a nib unit from a model 400. Over and above is valid nibs from all model 400, 400N, 400NN, M200, M250, M4XX, M600 (pre-1997): nib exchange is possible with any impunity. Nib units from the era 1950 until 1965 are different from the era 1982 and later. See declaration above about disassemble and using another nib unit.